Saturday is a good day for eating breakfast out. This morning’s gray mist made an outing even more appealing. 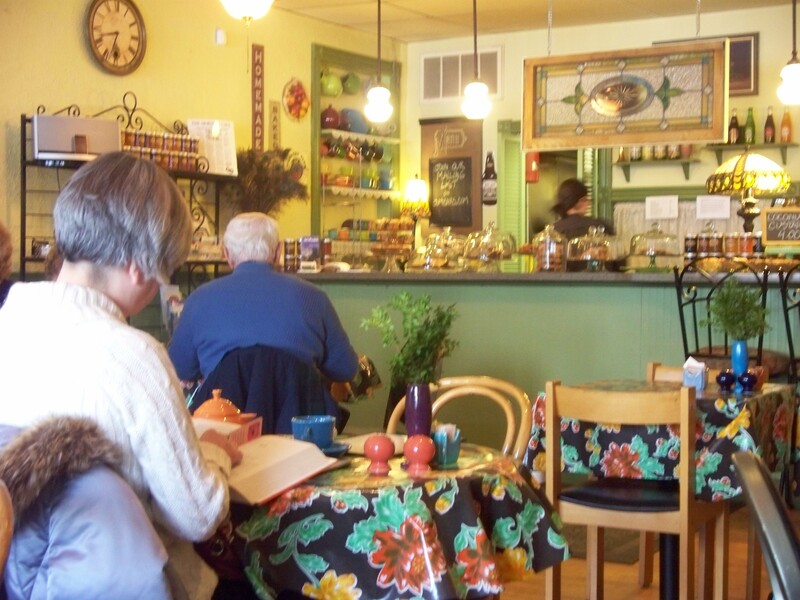 As I drove north from Bath on Route 512, I recalled my last visit to the BeanBath Café. It was a few days before Christmas and my son was just home from college. We were looking for someplace with an urban edge, tasty food, and strong coffee. I came across some rave reviews of a relatively new restaurant, new at least to me, the BeanBath Café. “Sure,” my son said after I’d read a few lines. “Let’s try it.” We weren’t disappointed. Today I was greeted by a pleasant young man who said to choose my own seat. “What ever is comfortable for you,” he said with a smile. I chose a table by a large window overlooking the vast green countryside. A waitress quickly appeared to take my drink order – coffee and a glass of water. I read through a menu filled with appealing choices. 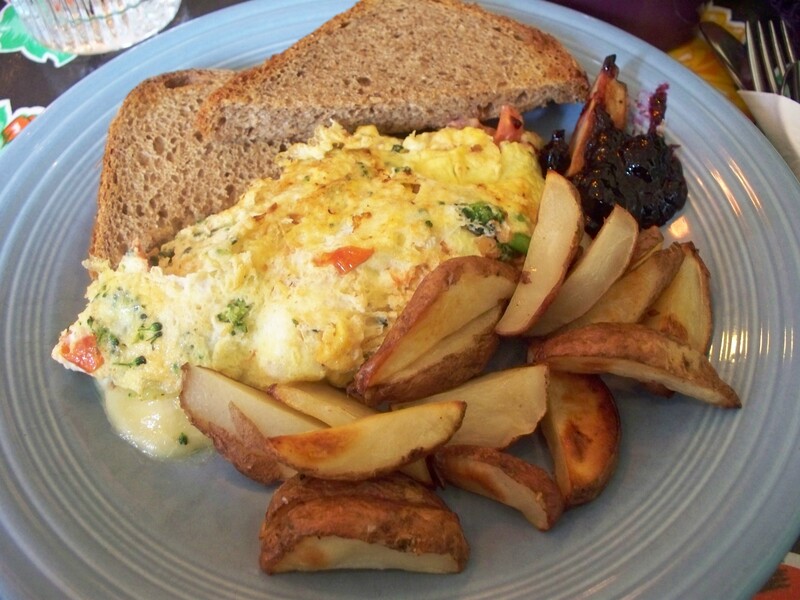 Omelets, Benedicts, scrambles, frittatas, burritos & quesadillas, breakfast sandwiches, French Toast, and more. Other reviewers often comment on the superb quality of the Eggs Benedict served at the BeanBath. (M would have loved the Benedicts, I thought. Always a favorite.) 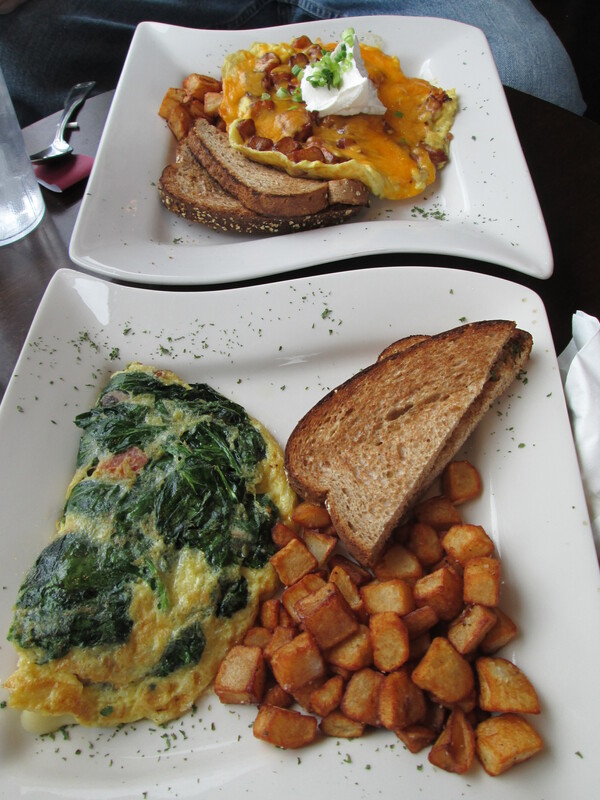 In December my son and I had each ordered savory omelets – spinach & provolone for me, cheddar & bacon for him. Scrumptious! But today I felt like something different. 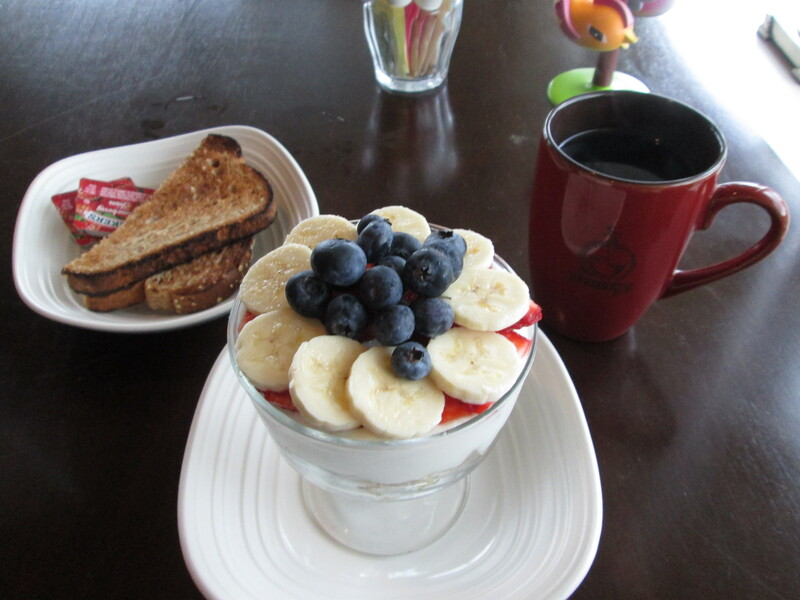 When the waitress returned I told her I’d like Yogurt, Granola & Fruit, along with a slice of whole wheat toast. While I waited I sipped robust coffee and opened my Kindle. Today I opted for a romantic short story I’d downloaded last month. A good choice. FLOWERS ON THE WATER by Helen Scott Taylor tells the story of Lucy and Dominic. Divorced ten years before after the tragic loss of their young son, they meet again through a twist of fate. Award-winning British author Taylor writes sweet, incredibly heartwarming fiction. This emotional tale, though short, brought mist to my eyes, appropriate for the day. (A tear-jerker, M would have said. Why do we treasure a cry over a good story or movie?) Nevertheless, it was a good choice for me. My breakfast, too, was a good choice. I’ve read that presentation is as important as preparation. Presentation is an art. If so, BeanBath’s chef is an artist. A base of crunchy granola was topped with yogurt overlaid with layers of sliced strawberries, perfectly ripened bananas, and sweet blueberries. Browned whole wheat toast was a good complement. Best of all, I savored the strong coffee. “It’s Spice Island,” said the waitress when I asked. “No spices, just a robust blend. Some find it too strong,” she said. Having grown up on the aroma and flavor of a strong brew, I didn’t. I loved finding a restaurant where I can count on a good cup. The bill for my meal – a yogurt parfait with granola and fresh fruit, a slice of whole wheat toast, and a large cup of coffee with refills, came to just over $9.00 (excluding tip). Excellent service, well-prepared food, and a cordial atmosphere. A thoroughly enjoyable morning. The BeanBath Café is located at 2425 Plaza Court in the SouthMoore Plaza, two miles north of Bath along Highway 512. Their hours are Monday – Thursday 7 am-2 pm; Friday 7 am to 3 pm, and 5:30 pm to 9:30 pm; Saturday 7:30 am to 3 pm, and 5:30 pm to 9:30 pm; and Sunday 7:30 am to 3 pm. Telephone – 484-287-2326. If you enjoy this review (and the BeanBath), I hope you’ll share it with others. The May sun slipped into my kitchen window greeting me with a soft smile. I was about to brew a pot of coffee when a thought whispered. Go out. I’ve learned to listen to such thoughts. So, I tucked my Kindle e-reader into my purse, grabbed jacket and car keys then stepped out into the fresh Saturday morning air. Life changed for me with M’s sudden passing. It happened more than a year ago without warning, too soon for us to be parted. We had so much left undone, and unsaid. In the early days of shock and grief, a dear friend offered sound advice. Go out to eat occasionally, she said, with family, friends, or with a good book. Just go out. I’ve often followed her suggestion. It’s eased the loneliness and helped me re-enter the world. 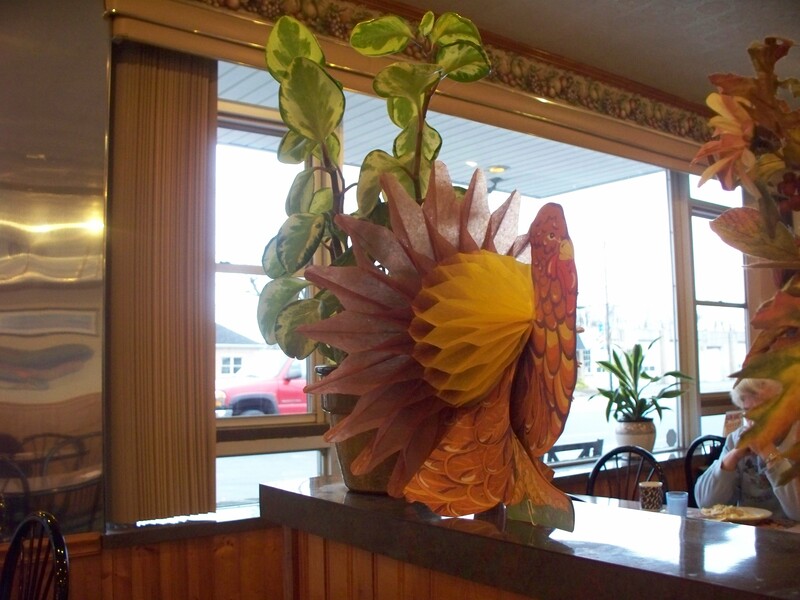 For this weekend’s outing I chose The Breakfast Table, a charming restaurant on Tatamy Road in Palmer Township. It had been a long while since I’d been there, but the eatery hasn’t lost its interior charm. At the front of the sunny dining room with its French country décor, the hostess greeted me warmly, offering a table of choice. I took one along the wall. A cheerful waitress brought me a glass of iced lemon water and steaming mug of black coffee. The single page menu held breakfast items on one side and lunch on the back. There was a broad assortment for breakfast – French toast, pancakes, Quiche, breakfast burritos, Panini, several omelets, as well as the more traditional eggs cooked to order, steak and other meats, and fruit. I opted for scrambled eggs, healthy fruit (in lieu of their delicious breakfast potatoes), whole wheat toast and thick strawberry jam. As I waited for my food I pulled out my Kindle and continued reading SOUL STRING, Book I by Casey Clifford. SOUL STRING tells the tale of a grad student, Brenna Jane (B.J.) Kelley, and her long-lasting relationship with Professor Caleb Forrester. It opens on the campus of the University of Madison in the turbulent 1970’s. It’s the first novella in a series that will span twenty years of B.J.’s life and career, a time of change for women in both the academic and the business world. Clifford’s voice drew me in with her compelling description and tidbits from another time. A truly intriguing read – can’t wait to finish this novella, and continue the saga. My food was delivered by the pleasant waitress. I took out a moment to take a quick picture for this blog then enjoyed the flavor of the eggs and fresh fruit. I continued reading. Around me I heard the cordial chatter of other diners enjoying their visits and meals. My scrambled eggs were moist and flavorful. I spread my wheat toast with thick, homemade jam. The fresh melon and strawberries were cool and sweet. The coffee was both fragrant and hot. As I ate, I saw large plates of blueberry pancakes and thick French Toast topped with cream pass by, headed toward another table. I almost envied the diners, then took another bite of strawberry. 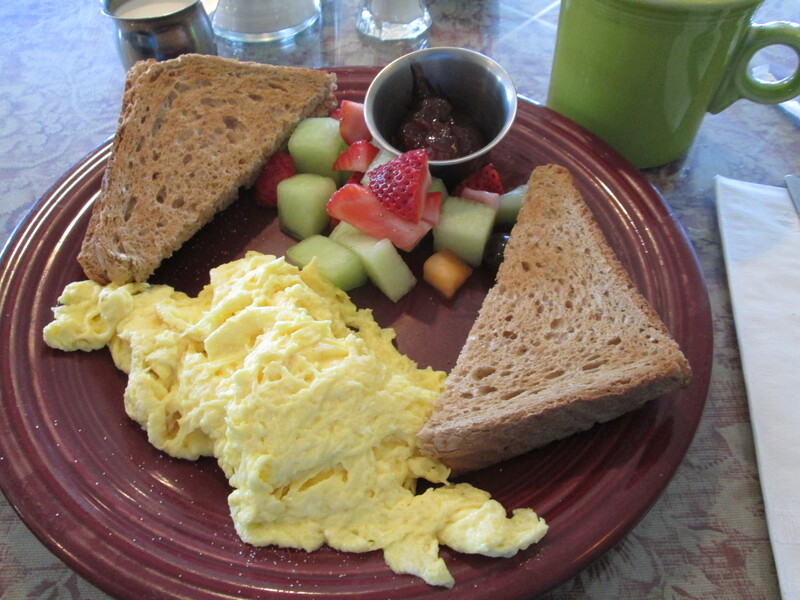 I had ordered two scrambled eggs, two slices of whole wheat toast with jam, fresh fruit, and coffee. The substitution of fruit for potatoes added $1.25 to my meal, for a total of just under $8.00 (plus tax and tip). The restaurant accepts only cash or check – no credit cards. 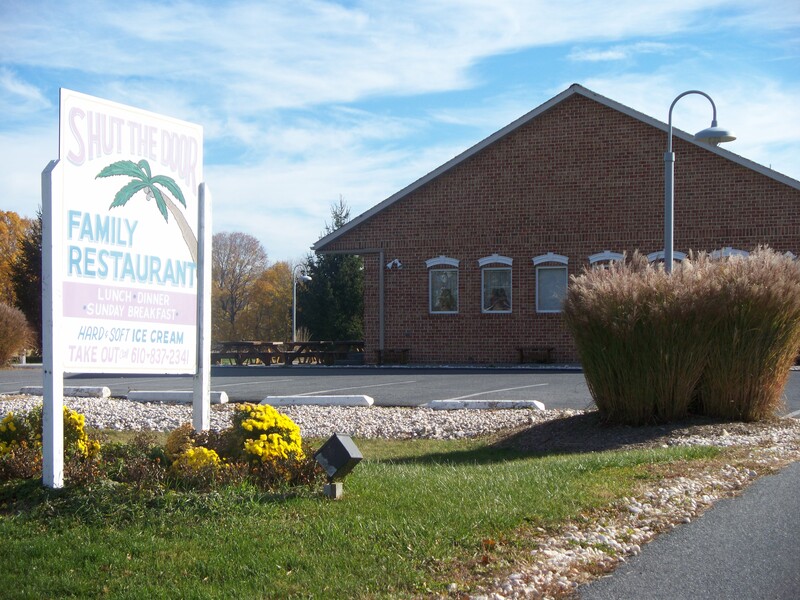 The Breakfast Table is located at 1315 Tatamy Road in Palmer Township. They are open Tuesday through Saturday, 7 to 2 for breakfast and lunch. Sunday hours are from 8 until 2, breakfast only. Closed on Monday. Charming atmosphere, friendly service, delicious food. What more can one ask? I wholeheartedly recommend a visit. Cost is $6.50 per person. Children under 12 are free if accompanied by an adult. Come and enjoy a savory breakfast while supporting a local volunteer fire department! Tatamy Fire Company is located on Bushkill Street in Tatamy, PA.
A Saturday morning drive north toward the scenic Delaware Water Gap along the PA & NJ border brought us to the Mt. Bethel Diner. Although we’d long heard good reports about this small town diner, it was our first visit. 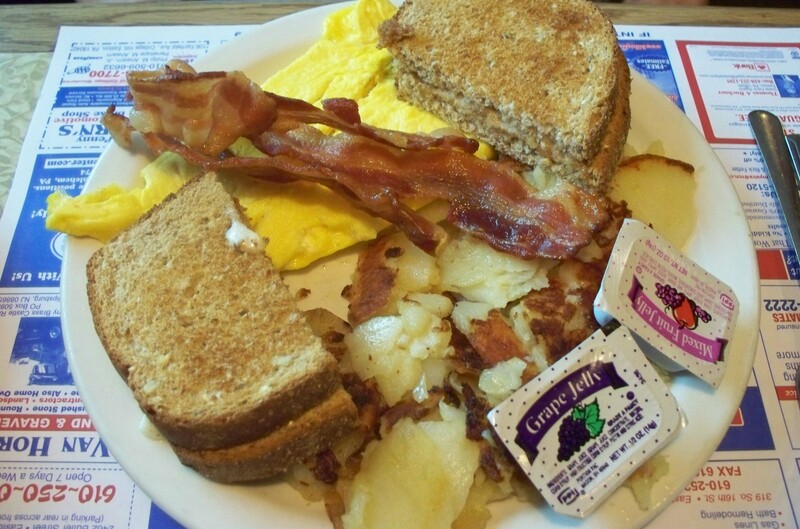 The diner hugs the winding Highway 611 and overlooks a wooded valley and mountains. Certainly a pretty setting. We arrived late mid-morning so the breakfast crowd seemed to be clearing and the lunch crowd not yet arrived. We were shown to a front window booth. A slender, dark-haired waitress cordially brought us tall glasses of water then stepped away to start a fresh pot of coffee. We skimmed through the menu. Although breakfast fare filled only one page of the large menu, there were ample offerings. The chocolate chip and blueberry pancakes briefly caught our attention but on further thought we both decided to go with eggs. Fragrant, fresh-brewed coffee arrived and we gave our orders. Bacon and eggs for me, steak and eggs for M.
With only occasional chatter M skimmed through his morning paper while I read an engrossing mystery on my Kindle e-reader. I’d been reluctant to buy one. But in the past years we’ve been trying to downsize and books seem to have taken over our house. When a close friend published her book in e-book format I decided to give it a try. It’s true that I still love the feel of a paperback in my hands, but the Kindle is very easy to read and I can adjust the font size as needed. I especially like the portability when we travel. Our food arrived almost too soon. My bacon was incredible and cooked crisp as I’d asked. The scrambled eggs were tasty, and the potatoes too many to finish. M’s steak was juicy and cooked a perfect medium, as he likes. Larger than expected. Other than a slightly dull steak knife, our meal was ideal. Throughout, our waitress discreetly kept an eye on our needs, and those of the folks around us. Our bill came to just over $17 (tax included but before tip) for my platter (4 slices of bacon, 2 eggs, homefries, and whole wheat toast) and M’s (2 eggs, a large breakfast steak, homefries, and toast), and our two cups of coffee. Coffee price is reasonable at $1.10 per cup. Excellent service, a pleasant atmosphere, and good wholesome food. It was our first visit, yes, but definitely not our last. The Mt. 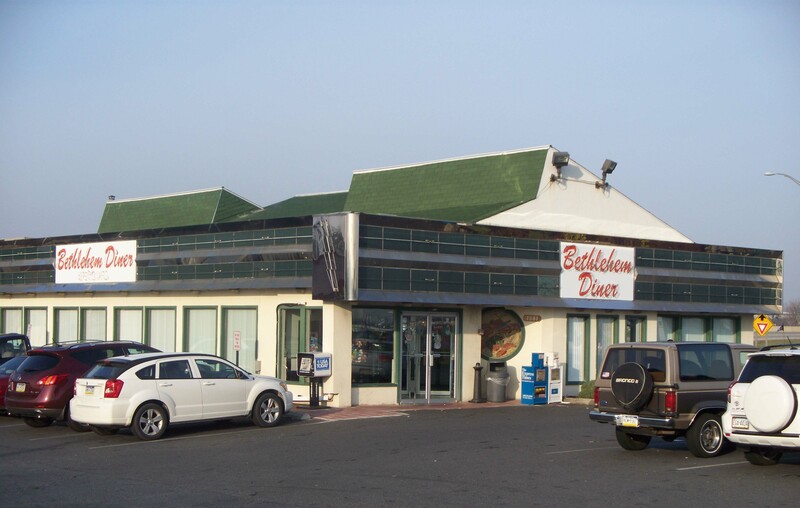 Bethel Diner is located at 2600 N. Delaware Drive (Hwy. 611) south of Portland in Mt. Bethel, PA 18343. 570-897-6409. They are open daily from 6 AM to 10 PM. An errand in Easton on this drizzly Saturday took us south on Sullivan Trail in Forks Township, PA. We decided to stop for breakfast at the Forks Diner, just down the road from Braden Airpark. As we entered the diner, a young hostess asked us if we’d like a booth or table. “A booth,” I said. Booths are quieter, more intimate, and it had been a long while since M and I had been out together on a breakfast date. Breakfast out with one’s husband allows time to talk and we had much to discuss. We’d just opened the menus when our waitress appeared, a middle-aged woman wearing glasses and a comfortable smile. She quickly brought glasses of water, cups and saucers, along with a filled carafe of hot coffee then gave us time to browse the list of offerings. We saw a huge variety of omelettes, along with French Toast, pancakes, and the usual other breakfast foods. 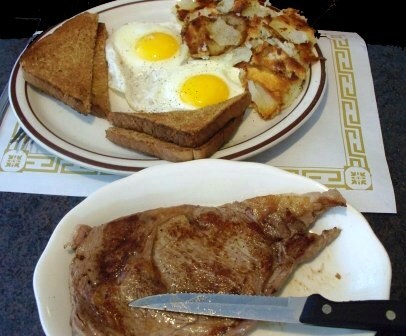 This morning M treated himself to steak and eggs. I opted for eggs and bacon. 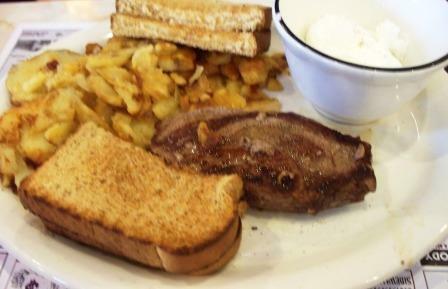 Both dishes came with homefries and toast. While we waited, we sipped steaming coffee. Not overly strong, more to M’s taste than my own, but it tasted good on this gray morning. We browsed through the newspaper, commenting on an article or two. Salary freezes and lay-offs caught our attention. Our food arrived promptly. M’s steak was more pinkish brown than the rare he’d asked for, but his eggs were poached nicely. My scrambled eggs and bacon were flavorful. The potatoes were crisp, as we’d asked, but they tasted old, like they’d been cooked up yesterday. Not sure I’d order the homefries again. Our wheat toast was evenly browned and hot. The Forks Diner is larger than it looks with two sides for seating, along with a counter. It is slightly dated but still has a nice, friendly atmosphere and the booths allow private conversation. We enjoyed talking quietly in our high-backed booth, catching up on our daily work lives. I noticed others also engaged in similar quiet talk. Throughout our meal our waitress was attentive but not invasive as she checked back occasionally to see what we might need. Friendly service. Our total bill came to just over $17 (plus tip) for my meal of two scrambled eggs, homefries, three slices of bacon, toast, and coffee, and M’s plate that included a small steak, two poached eggs, homefries, toast, and coffee. Two could easily eat breakfast for under $10, depending on what was chosen. 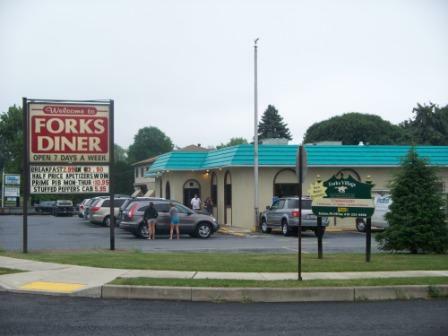 The Forks Diner is located at 3315 Sullivan Trail Easton, PA 18040-7621. (610) 252-1028. I hope you stop by for a visit. Eating breakfast out is good for the economy, and maybe good for your relationship, too! Jumbars had long been on our list of places to visit, recommended by more than one reader of BITV. The café was established in 2003 by Chef Paul Hoffert and his wife, Mary. The café’s name and many of its recipes, originate from Mary’s great-grandmother, Anna Jumbar. Around 8:20 am, we walked into Jumbars and took a table against the south wall. The café is small, seating roughly 30 to 40 people. Floral tablecloths, local paintings, and vases of fresh cut boxwood all contribute to a cozy charm. At the front is a walk-up counter that displays some of their delectable homemade pastries and breads. Our waitress brought us menus, followed by coffee and tall glasses of water. Although we’d already had a sneak preview of the menu on Jumbars’ website, we took our time perusing the many offerings. Assorted omelettes, and homemade breads caught our eye. M chose a New England Omelette with a homemade English Muffin. I chose a Garden Omelette. As we waited for our food we chatted quietly about the past week and the spring to come, in the way of old married folk. Around us singles read, while friends and other couples talked. At the table behind us, grandparents had their two-year old grandson for a Saturday morning outing. The well-mannered boy thoroughly enjoyed his whole wheat waffle with Nutella and bananas. Our breakfast soon arrived. “The jams are on the sideboard,” said the waitress. We each made a trip up front to choose from assorted jam pots of homemade preserves. Also on the sideboard was a huge selection of teas. My own Garden Omelette was among the best ever. The inside was moist and stuffed with small cut pieces of broccoli and tomatoes, and the perfect complement of cheddar cheese. The omelette came with one piece of whole wheat toast, cut in two, but that’s all I needed. It was hearty and filling, easily the equivalent of two pieces of store-bought. With a few dabs of homemade blueberry jam, it was perfect! Throughout our meal in this most pleasant café, our coffee cups were kept filled with fresh ground Dean’s Beans organic coffee. Rich and superb! As we finished, more people arrived. I was glad we’d arrived early. Our bill for a New England Omelette with breakfast potatoes and a homemade English muffin, and a Garden Omelette with breakfast potatoes and a thick slice of wheat toast, and two cups of coffee came to just under $20 (plus tip). Of all the restaurants we have visited for breakfast over the years, we both agree that Jumbars is by far, among the best for food quality, preparation, atmosphere, friendliness, and service! Congratulations to the Hofferts for creating a true gem in Bethlehem. 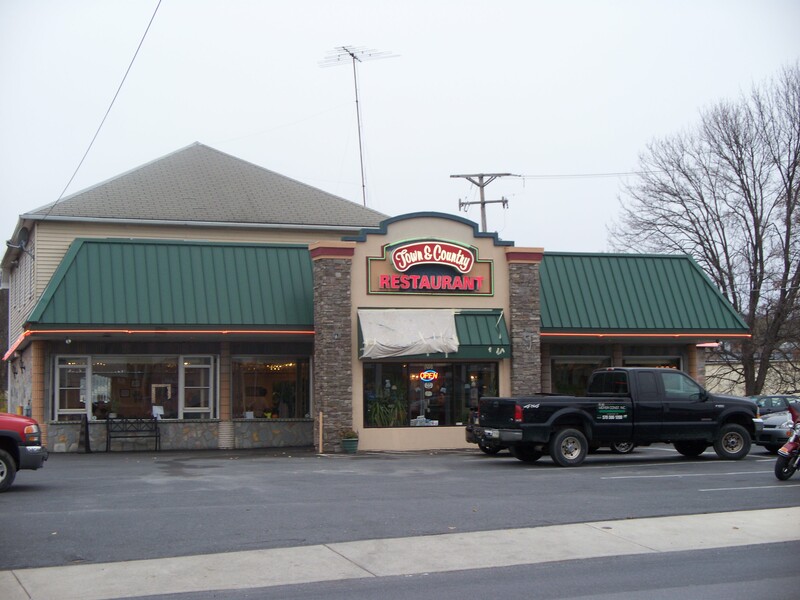 Jumbars is located at 1342 Chelsea Avenue in Bethlehem. 610-866-1660. The café is open for breakfast and lunch, Tuesday through Friday, 8 am to 3 pm, and Saturday and Sunday, 8 am to 2 pm. 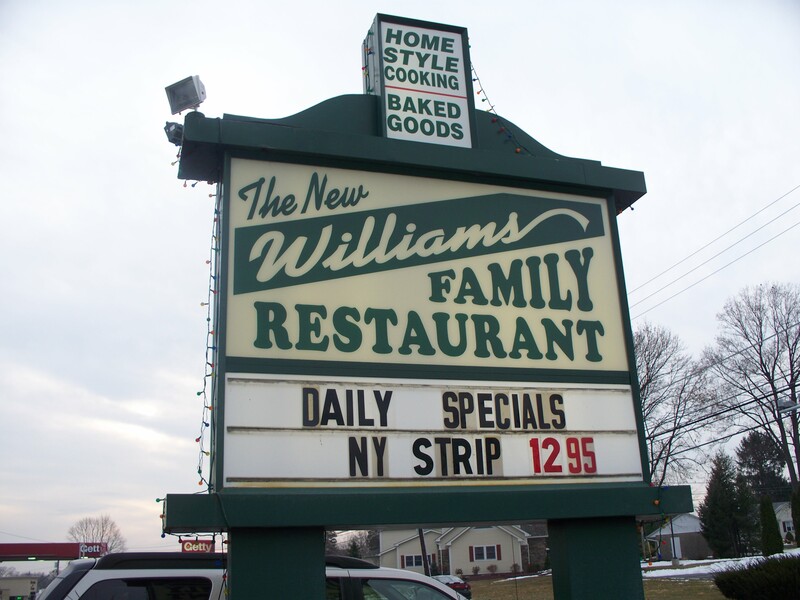 On a frigid day in early January, my son and I drove to The New Williams Family Restaurant in Easton for a late morning breakfast. As the host seated us, I noticed that the décor has been updated since my last visit, a few years ago. The walls and woodwork sported tasteful paneling, there were new booths, tables, and carpeting. Even saw a few flat screen televisions scattered about. Overall, a warm, inviting feel. We asked for a booth and were led to the front window overlooking William Penn Highway. Our waitress was young (isn’t everyone these days? ), prompt, and friendly. She stepped away to get our coffee and my son and I skimmed through the extensive breakfast menu. By the time she returned with our coffee and glasses of water, we’d settled on our standard fare – scrambled eggs and homefries. Outside, winter gray clouds hung overhead but inside the dining room was warm and comfortable. While we waited for our meals my son and I chatted, catching up with the events in each others life. All around us came the gentle hum of others doing the same. The manager and staff moved easily around large restaurant, greeting customers like old friends. 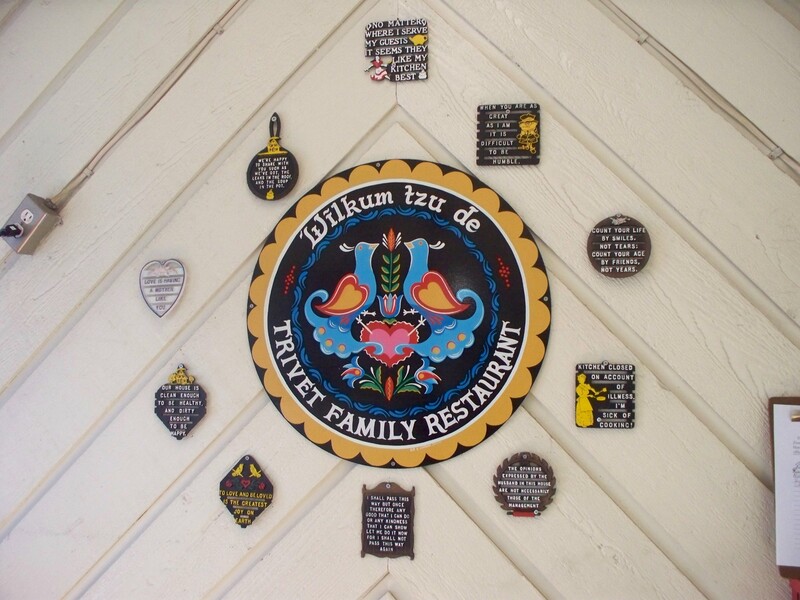 It seemed evident that The New Williams Family Restaurant has a very loyal and regular clientele. We may soon be among their numbers. In no time, the waitress brought out our food on warmed plates. Our eggs were nicely scrambled and the potatoes browned , as we asked. Although his bacon wasn’t quite as crisp as he normally likes, he said it was still tasty. We both especially like the toast made from grainy whole wheat bread. It was fresh, hot, and flavorful. I ordered mine dry then skimmed it lightly with strawberry jam. Delicious! Although there was no carafe, throughout our meal the engaging waitress kept our coffee cups filled. Our meal came to just over $13 (not including tip) for two coffees, and two platters that included eggs, homefries, and toast, and one order of bacon for my son. A pleasant breakfast in a pleasant spot. 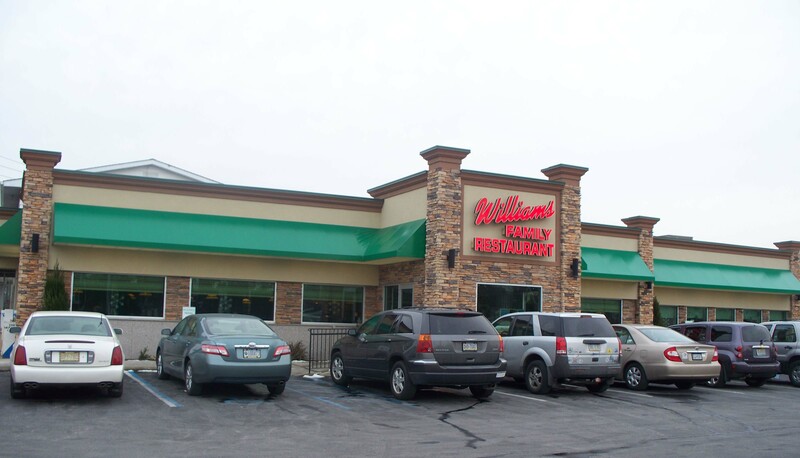 The Williams Family Restaurant is located at 3630 William Penn Highway, Easton, PA 18045-5119. (610) 253-8281. They are open daily from 5am-10pm. 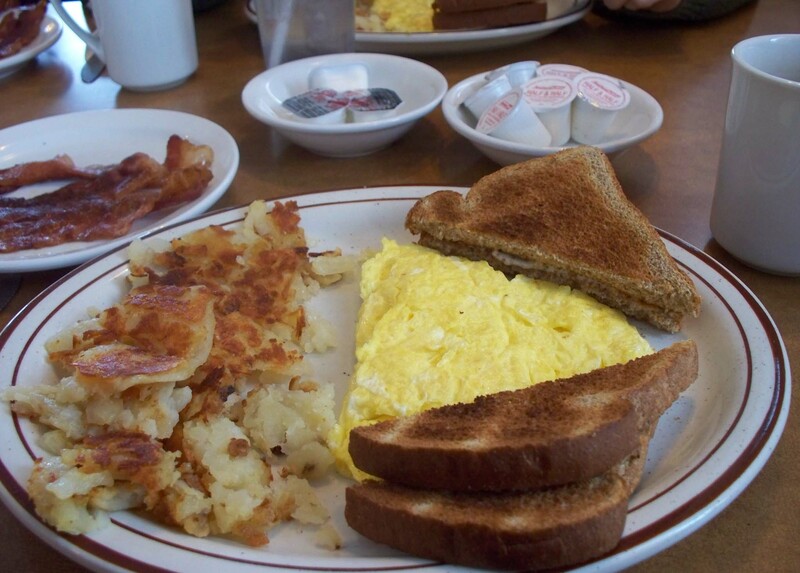 Stop in for breakfast – soon! You’ll be glad you did. The Christmas season arrives faster each year. Since M. had some other matters to see to today and since I still had a lot of holiday shopping to do, I decided to set out alone this Saturday morning. I left home early. That way, I’d have time to stop for a quick breakfast at the Bethlehem Diner before the stores opened. 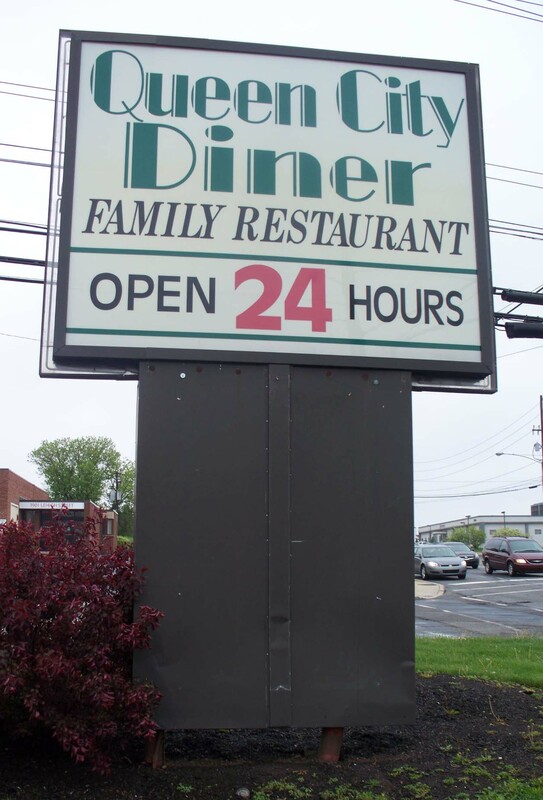 The diner is central in the Lehigh Valley, a convenient spot no matter which direction a person is traveling. As I walked in the front door, I was greeted by a glass dessert case filled with assorted delectable pastries. I took a single longing glance then asked the cashier for a booth next to a window. In a friendly voice, she said to choose one. Simple red and green garlands of tinsel looped through the restaurant adding a festive touch to the rooms. Sunlight streamed through the large windows. Around me several couples talked quietly, enjoying their morning meals together. A tallish dark-haired waitress brought me a menu and soon returned with my requested coffee and glass of water. The menu features standard breakfast fare — egg dishes, omelets, French Toast, pancakes, and a few specialities. Since I planned to shop much of the day, I wanted something wholesome, a food that would stay with me. I chose a favorite, heart-healthy oatmeal and toast. While I waited for my food, I took out my Kodak and scrolled through some pictures. For Christmas, I plan to use some of them in creative ways for a few special people. Last night I had reviewed the website for Dan’s Camera City. Dan’s has many such items — photo mugs, personalized calendars, photos artistically reproduced on canvas, and even cutting boards with photos printed onto them. I pulled some note paper from my purse and began jotting down ideas. After breakfast, I would drive to Dan’s. Other scheduled stops included The Christmas Tree Shop, Best Buy, and a few other assorted stores. A full day of shopping waited! My oatmeal arrived quickly and was followed by the toast a minute or two later. The oatmeal was thick, tasty and definitely homemade. The toast was made with fresh wheat bread, and still hot from the toaster. Spread thinly with blackberry jam it, too, was delicious. During my meal the waitress kept my cup filled with fresh black coffee. 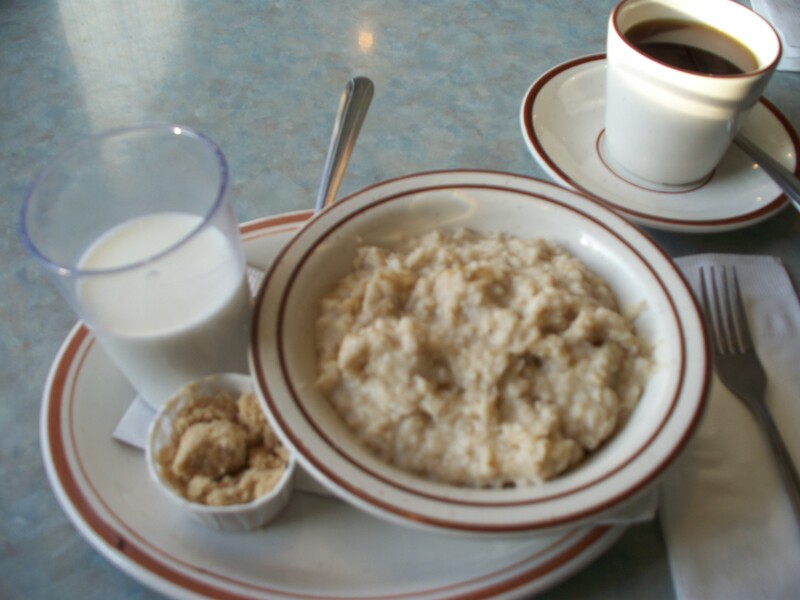 The total amount of my bill was under $5.00 (excluding tip) for a large bowl of oatmeal, an order of wheat toast, and plenty of coffee. Reasonable. 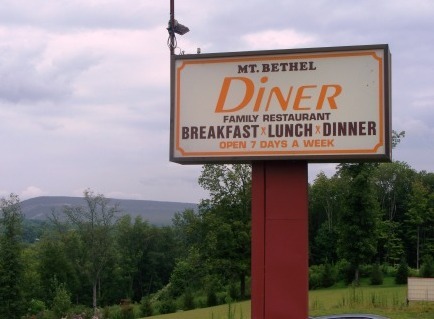 Overall the atmosphere in the Bethlehem Diner was pleasant, tables were cleared quickly and efficiently, and the service was friendly. A good place to stop for a bite to eat when you’re out shopping, after a movie, or anytime. I plan to return. 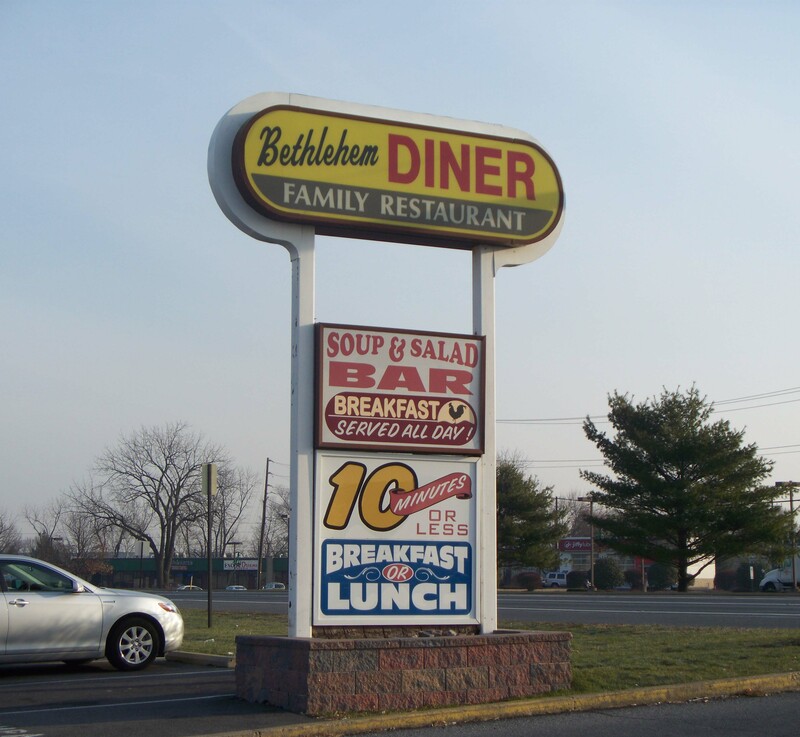 Bethlehem Diner is located at 1881 Catasauqua Road, Allentown, PA 18109. It’s just south of ABE Airport and Highway 22, on the east side of Airport Road. (610) 266-9235. We woke early this morning, a regular weekday habit that doesn’t go away on holidays. With just our immediate family expected for Thanksgiving dinner this year, and not until early evening, we decided to go out for breakfast. M. and I donned our warm winter jackets, hopped into our car and drove west toward Bath, PA and the Town & Country Restaurant. My decision over what to order was made before I stepped from the car. 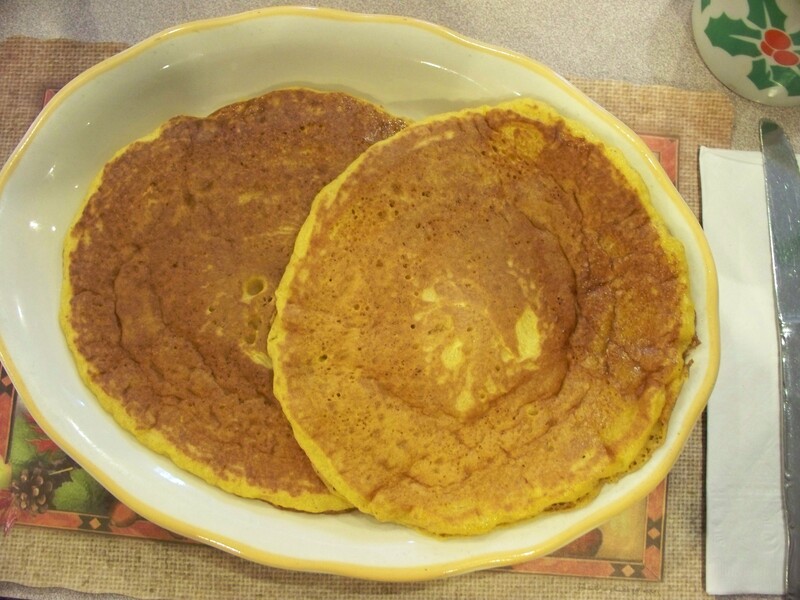 The large sign announced “Pumpkin Hotcakes.” What better choice could there be for a Thanksgiving Day breakfast? 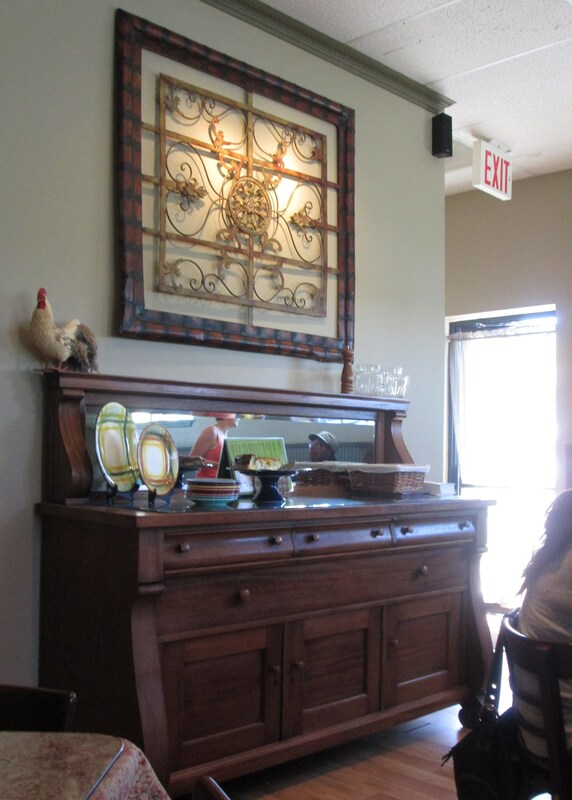 With its homey country decor, the restaurant felt warm and inviting. The smiling hostess immediately showed us to a bright booth off to the left. We asked for coffee and water then settled in to study the extensive breakfast menu. Lots of standard breakfast fare but we also saw a few surprises. The Godfather Omelet was topped with marinara sauce. The chili egg dish looked perfect for a cold winter day. But I couldn’t get those Pumpkin Hotcakes out of my mind. A friendly waitress took our order then disappeared into the kitchen. We skimmed through sections of the morning paper. Stores will open earlier than ever for Black Friday sales, some as early as 3 AM. (Why go to bed ?) A few department stores are offering Black Friday specials on Thanksgiving Day — online orders only but with free shipping. Amazing. Many retailers vying for fewer dollars. As our waitress brought our food we realized the restaurant was filling up. Others, old and young, were sitting down at the counter, and at tables and booths. Glad we got there early. 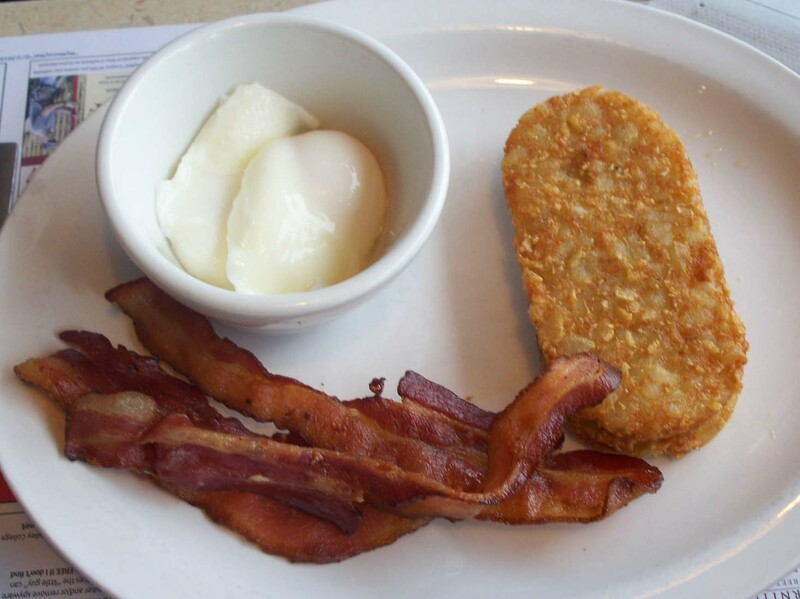 M. had ordered his latest favorite — poached eggs, bacon, wheat toast. His large eggs were hot, the bacon crisp, and the toast nicely browned. I’d ordered only two pumpkin pancakes; I could have been satisfied with one. They were huge, hot, and delicious. The pumpkin flavor was subtle with the cakes moist and filled with flavor. The waitress had offered me a choice of syrups — regular, lite, and sugar free. I used the lite syrup sparingly. Truly wonderful. Our bill for breakfast — his two eggs, three slices of bacon, wheat toast, and my two large pancakes, plus our two cups of coffee — came to just over $10 (not including tip). A reasonable price. With its warm, inviting atmosphere, friendly and efficient service, and good home-cooked food, the Town & Country in Bath is well worth a visit. 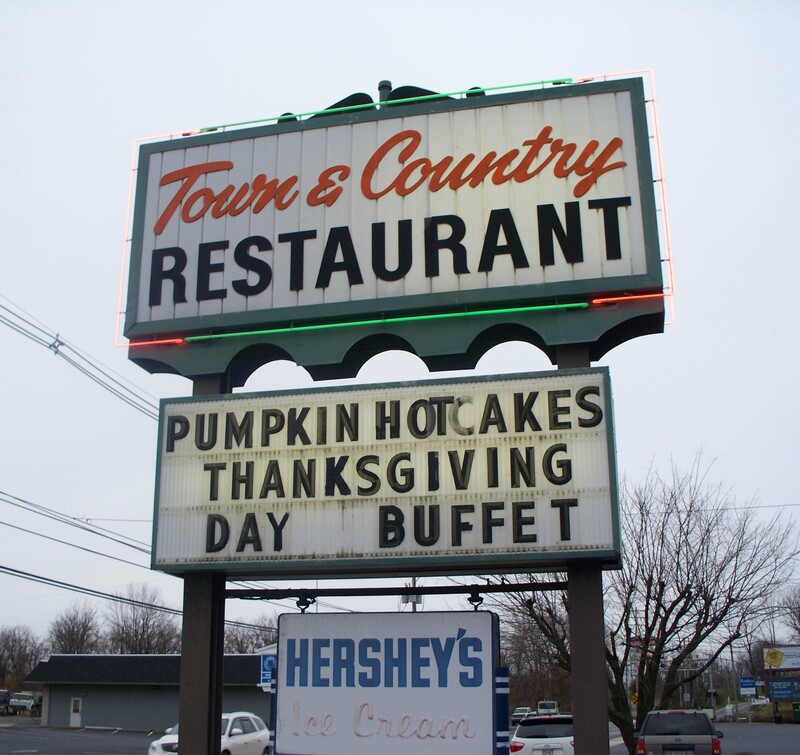 The Town & Country Restaurant is located at 350 S. Walnut Street (Hwy. 512) in Bath, PA. 610-837-7220. 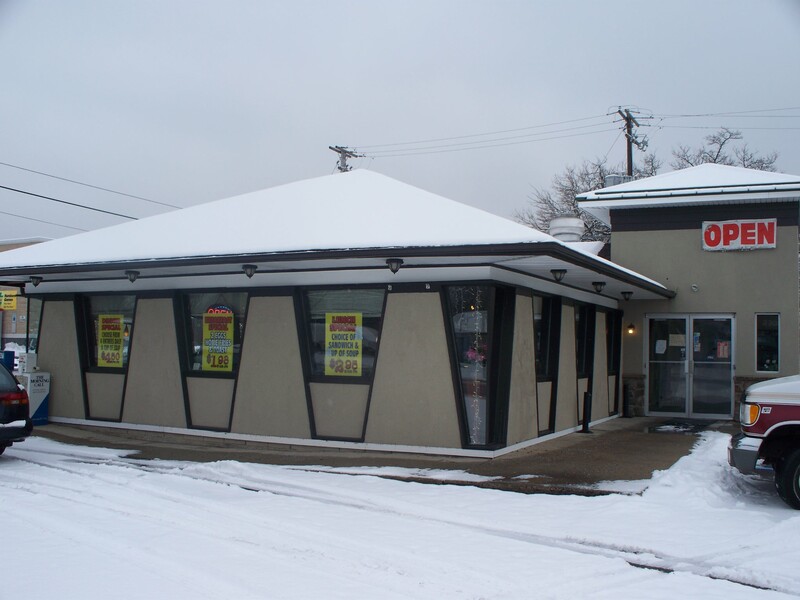 They are open seven days a week for breakfast, lunch, and dinner, and also provide take-out orders. Today they are serving a special Thanksgiving Day Buffet from 11 AM to 7 PM. P. S. This evening we will gather with those closest to us. We’ll dine on roast turkey and stuffing, on sweet potatoes, cranberries, and green beans. After the table is cleared, if there’s still room in our bellies, we’ll fork in some pumpkin or cherry pie topped with a scoop of vanilla ice cream We’ll talk, and laugh, and take joy in our time together. Family, friends, food — reasons aplenty to be grateful. May you and yours find happiness together this Thanksgiving Day! Blessings and a warm thank you to all. 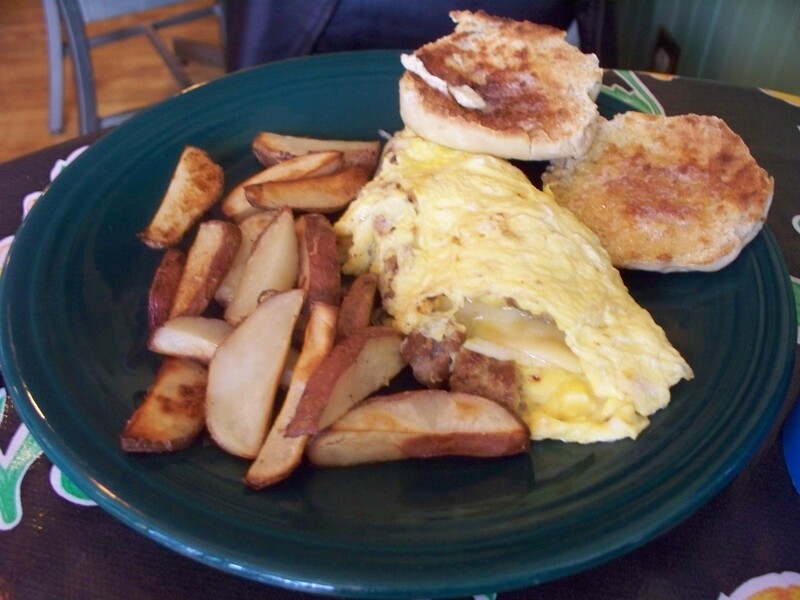 The Tatamy Fire Company on Bushkill Street in Tatamy, PA will hold a breakfast featuring Cheese Steak Omelette, Ham and Cheese Omelette, Ham and Eggs, Pancakes, Sausage, French Toast, and their own special “mix.” Also featuring homefries, juice, coffee, tea, and breakfast cakes. Cost is $6.00. Children under 12 are free if accompanied by an adult. 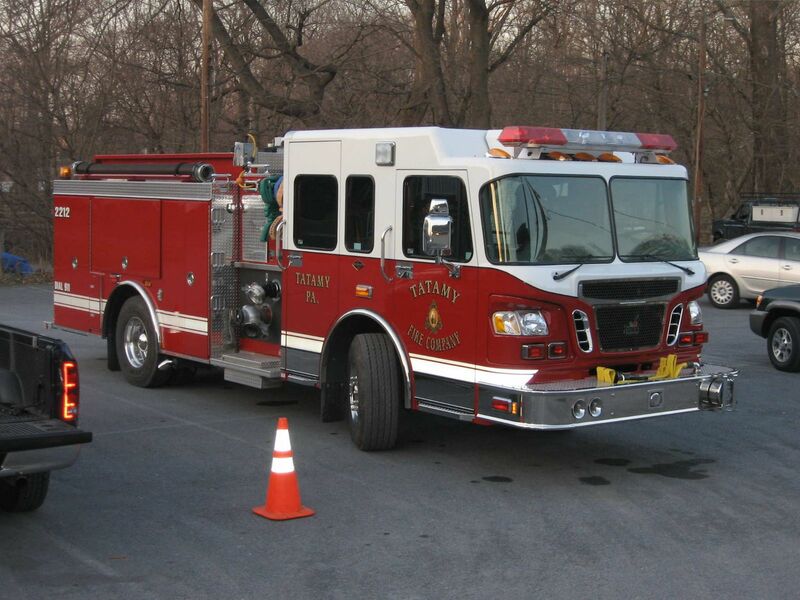 The Tatamy Fire Company breakfasts are held every 3rd Sunday of the month from September through May. The Klecknersville Rangers Volunteer Fire Company Ladies Auxiliary will host an All You Can Eat Breakfast Buffet including sausage, bacon, ham, pancakes, French Toast, scrambled eggs, hash browns, beverage and more. Cost is $6.00 for adults, $3.00 for children 5 to 12, and children under 5 free. For more information call 610-837-1360. If you have a fund raising breakfast you’d like to announce on Breakfast in the Valley, contact me by clicking the tab at the top of the page. Shut the Door (Ice Cream & More) may not be the place most people think of for breakfast. But this morning, as M. and I were driving west across the Valley, we saw they had an OPEN sign in the front window. We hadn’t yet eaten and wondered if they might serve something other than their truly fabulous ice cream. Perhaps breakfast? We turned around and drove back into the parking lot. We walked into the dining room, passing their glass ice cream case, and settled into a booth next to the front window. A friendly young waitress greeted us with menus then quickly brought our requested two cups of coffee and tall glasses of iced water. Shut the Door’s breakfast menu features a nice variety of omelets, pancakes, and French Toast, along with a large selection of other assorted breakfast fare. I almost expected there might be an offering of an ice cream topped waffle on the breakfast menu but didn’t see it. A table sign did offer “funnel cake fries.” Almost took them up on that but I’ve been watching my carbs. 🙂 In no time at all we’d placed our simple order for eggs and bacon. While waiting for our meals (a short wait; they came fast), M. skimmed through the morning paper while I played with my camera. Lots to capture in the charming décor. One corner displayed two surf boards and a brilliant oil painting of a couple at the shore. There’s also a Betty Boop statue, a hanging parrot, and wall-mounted juke boxes. A huge chalkboard shows lunch and dinner specials. Some appetizing looking offerings were posted there! Overall the atmosphere was friendly, cheerful, and appealing. As mentioned, our food came quickly. Our eggs and bacon were well-prepared and hot from the kitchen. Our wheat toast arrived hot and fresh, and our charming waitress kept our coffee cups filled. A delightfully delicious meal! Our total bill including tax came to a few cents over $10 for an order of two scrambled eggs, bacon, toast, and coffee, and an order of two poached eggs, bacon, homefries, toast, and coffee. Quite reasonable! Shut the Door Ice Cream & More is located at 2693 Community Drive, just off Hwy. 946 and north of Bath, PA 18014. 610-837-2341. NOTE: Breakfast is only served on Sundays. It’s well worth a visit for a Sunday breakfast, or anytime! The winter of 2010 seemed endless. Life grew more complicated when illness struck. Weeks flew by. I wondered when things would return to normal. But then the snows started to melt. Seasonal rains and warming temperatures coaxed leaf buds and flowers into bloom. Spring arrived, in all its glorious beauty. This morning M. announced that it had been too long since we’d been on one of our diner dates. My improved health was reason to celebrate. He asked where I wanted to go. I pulled out my wish list of Lehigh Valley Restaurants. “You choose,” I said. He glanced at the list then said “the Queen City Diner.” We’d first heard of it from a friend who raves over their warm service and yummy pancakes. Just the ticket on this drizzling spring morn. Queen City Diner is about a half hour drive from our home. Highway 78 to Exit 57 then north on Lehigh Street. Strangely, I felt almost giddy on our drive. Nothing like a lingering illness to make one appreciate the little things in life. The diner sits across the road from a CVS Pharmacy, just north of the Queen City Airport. We took one of the last parking spots near the back of the building. Inside, the restaurant was packed but our wait was short. Our cordial hostess quickly showed us to a booth next to the front window. The staff bustled through the crowded dining room, taking orders, serving food, clearing tables and counter. Our waitress delivered a carafe of coffee with two cups, and glasses of water. She gave special instructions on using the carafe. We browsed through the extensive breakfast menu and specials. Assorted omelets and other egg dishes, stuffed waffles and French Toast and, of course, pancakes. So much to choose from, and all of it looked GOOD! I almost ordered the sweet potato pancakes, our friend’s favorite, but decided the blueberry pancakes had more appeal this morning. M. chose a bowl of oatmeal, followed by eggs, bacon, and hash browns. As we sipped on our coffee, we glanced around the 50’s style diner decorated in the traditional diner colors of dark pink and turquoisy-green. The roomy booths each held a small table top juke box. We resisted the urge to plop in some coins for music; the aisles weren’t big enough to dance. The room was filled with patrons of all ages. Families and couples sat comfortably enjoying their morning out. The delicious aroma of fresh cooked breakfasts drifted from the kitchen. Our friendly waitress delivered M.’s oatmeal first, as he’d requested. It was a large bowl, hot and steaming. He poured on a little milk and began to eat. Soon the rest of our food arrived. 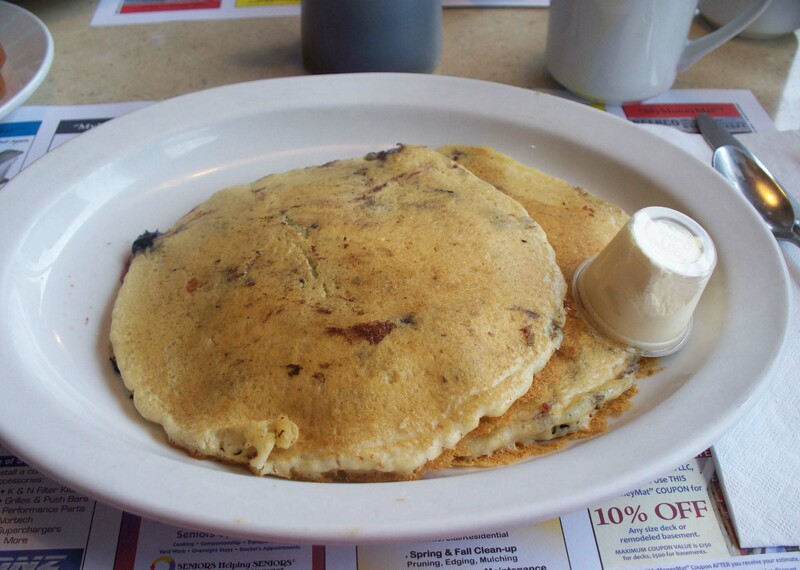 My short stack of blueberry pancakes looked very good, and tasted even better. While the blueberries were only faintly apparent from the top, when I cut into them I found they were each packed with delectable juicy blue. Perfect! M.’s hash brown patties were browned and crisp. The picture seems to show only one hash brown, but two patties were stacked — thick, and delicious. His poached eggs were slightly over cooked for his taste, but the inside yolk was still runny and a rich yellow. I pinched an end from his bacon and found it wonderfully crisp and salty. Our total bill (excluding tip) came to just over $11 for a short stack of blueberry pancakes, a large bowl of oatmeal, two eggs, two hash brown patties, three large pieces of bacon, two slices of toast, and two cups of coffee with carafe. All prices on the menu were most reasonable, among the best we’ve seen in the Valley. Service was cordial and efficient. Definitely a place to visit again, and again! 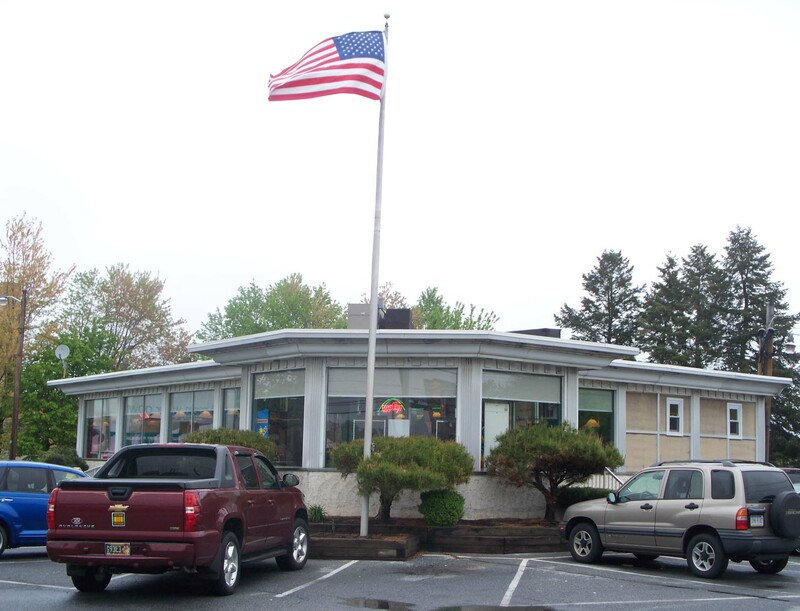 The Queen City Diner is located at 1801 Lehigh Street, Allentown, PA 18103. Telephone 610-791-0240. They are open 24 hours a day. Propietors are Ody & George Draklellis. I hope you’ll try them soon! When I asked my husband where he’d like to eat breakfast this morning, he said “Find a place in Emmaus. We’ve never eaten there.” A glance through my list of reader recommendations sent us toward The Trivet Family Restaurant, a popular spot in Emmaus that we’d been told offers exceptional home style cooking, including traditional Pennsylvania Dutch food. Although the weather was a chilly 27° when we left home in Nazareth, and a colder 21° in Emmaus, the morning was pleasant with a golden winter sun and the powder blue skies that often appear in the January cold. When we arrived, the Trivet’s parking lot was nearly full but we found a few open spaces. Inside, we were escorted to a booth next to a side window. Our waitress delivered menus, along with our requested coffees and water. The menu had an extensive list of Omelets, Belgian Waffles, “Eggsceptional Offerings” and many other breakfast favorites. Both of us were hungry and we chose quickly. 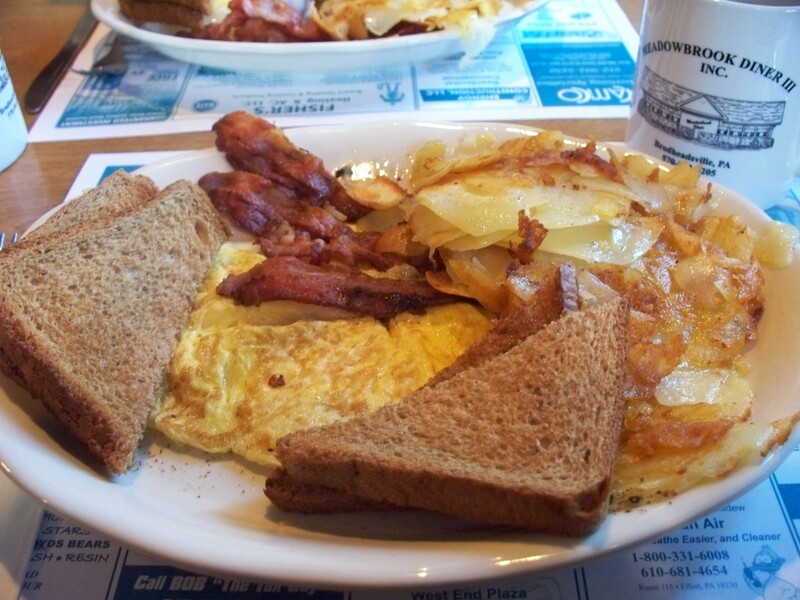 We saw that home fries are not included with the dishes, so we each asked for a side order. In no time at all our waitress delivered our nicely warmed plates. M. chose his favored Eggs Benedict and side orders of home fries, and link sausage. He received six links, superbly cooked. The Eggs Benedict was also cooked to his taste. 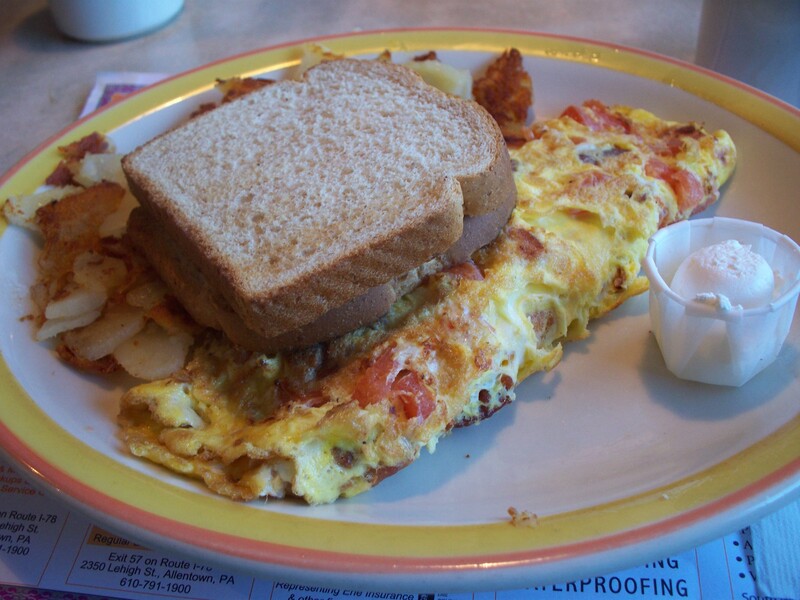 It had been a while since I’d eaten an omelet so I chose a Bacon, Tomato, and Cheddar omelet from the specialty menu. No salt and pepper was needed; it was filled with flavor. My toast came unbuttered and on top of the omelet so it stayed warm; a dollop of whipped butter came on the side. What a good idea. More restaurants should do that. We both found our homefries crisp and delicious. Great food! Throughout our meal our waitress kept up a steady round of good-natured conversation with every table she waited on. It was delightful to see her chatting away in such a cordial manner while still seeing to the needs of each and every customer. She was quick, efficient, and friendly. We never wanted for anything, nor did anyone she served. Our total bill came to just over $16 (plus tip) for an order of Eggs Benedict, a bacon, tomato, and cheddar omelet, whole wheat toast, two side orders of home fries, six links of sausage, and two coffees with a carafe for refills. Reasonable prices, great food, and terrific service. I understand the popularity and am sure you will, too. 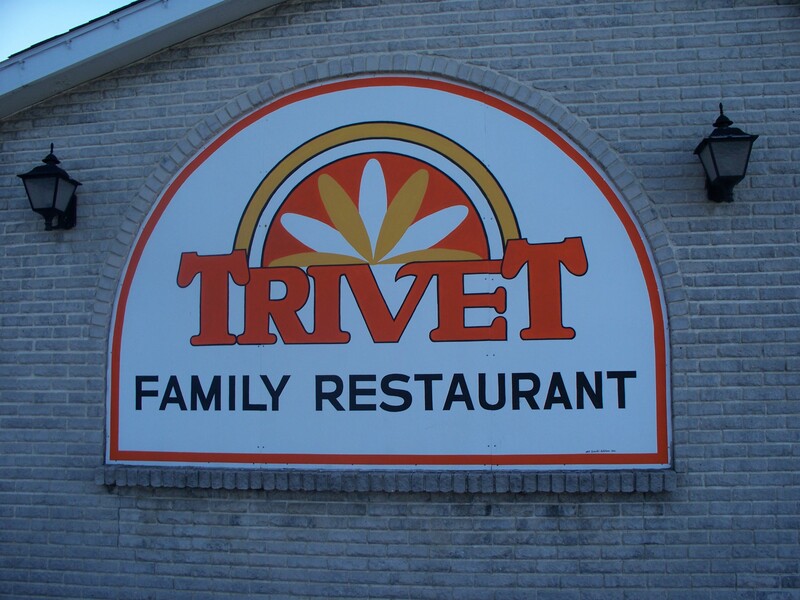 The Trivet Family Restaurant is located at 4102 Chestnut Street in Emmaus, PA. 610-965-2838. Last year, a few months after I started this blog, our son recommended we compare four diners along Union Boulevard, east of Airport Road. Some call the area “diner row.” In January 2009 we visited his first recommendation, the Golden Gate Diner at 1318 Union Boulevard. In June we ate breakfast at the Top Diner at 1019 and, in mid-August, we ate at Izzy’s Family Restaurant, at 920. Somehow it seemed fitting to end the year at the newest of the four, the Union Diner & Family Restaurant, located at 2302 Union Boulevard. The Union Diner opened about two years ago. I read that the building had previously operated as a Pizza Hut; the signature windows are still intact. The interior, however, was fully remodeled with new tiled floors and booths. On this snowy morn, the diner was nearly empty. My son and I were offered our choice of seating. We chose a booth along the front wall. A smiling waitress brought menus that included a large list of the usual diner breakfast options. She soon returned with our coffee and tall glasses of iced water with straws. 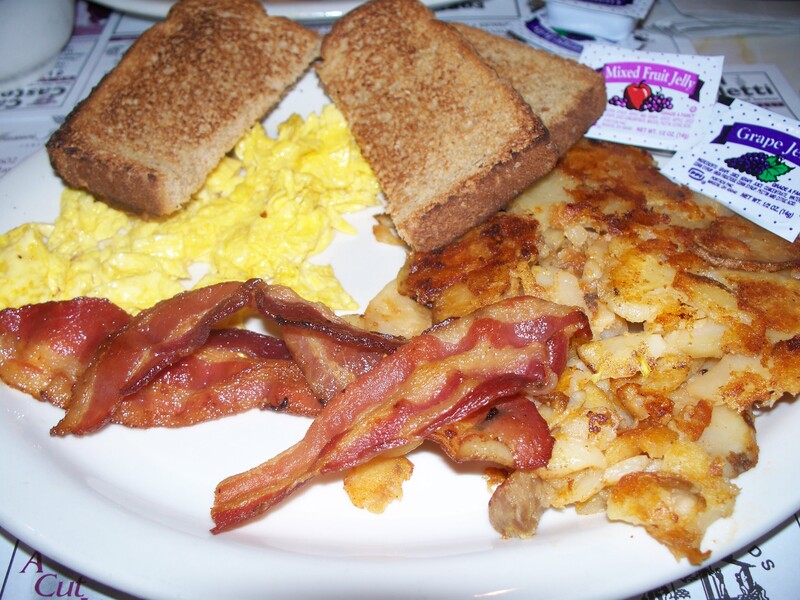 We placed our orders for one of the breakfast specials – eggs, homefries, bacon. One advantage of eating out on a weekday, other than choice of seating, is the prices on the specials. We sipped steaming hot coffee, chatted, and looked around. The dining room, still with that new feel, appeared sparse, almost barren; only a few red ribbons still celebrated the holiday. A sign above the dessert case near the front announced “Under New Management.” After only two years? As I mulled it over, through the west window I saw two men across the street pushing snowblowers. They seemed in rhythm as they came together then parted along their separate paths. Our food was delivered promptly and with another smile. I was disappointed to learn there was no strawberry jam for my toast. The cordial waitress said they only offer grape and mixed fruit jellies. Both my son and I found the scrambled eggs to be the tastiest part of the meal, moist and fresh. The home fries were golden crisp and not too greasy. Bacon was tasty. The coffee wasn’t quite as strong as I like it, but our watchful server kept our cups filled. The total cost of the meal was just under $7 (plus tip) for the two of us. 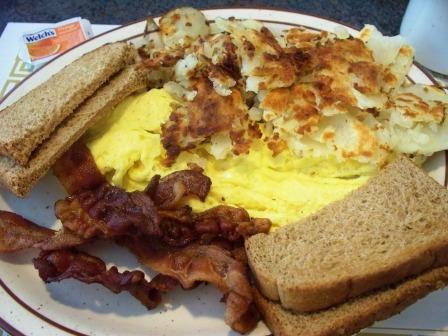 A real bargain for two orders of scrambled eggs (2), homefries, 3 slices of bacon, whole wheat toast and coffee. As mentioned, an advantage of eating out on a weekday morning. I have to wonder if an added 50 cents would have provided the strawberry jam most diners offer. No matter. 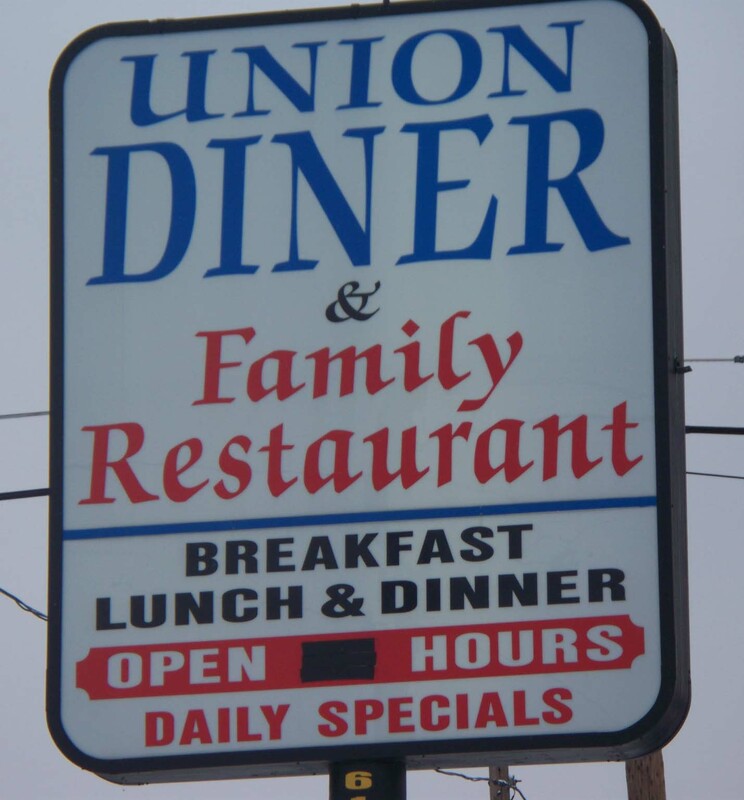 I’m told there will soon be new menus and a new name for the Union Diner. Members of the same family that now own the increasingly popular West Side Diner at 19th and Tilghman will rename this one the East Side Diner. It will be interesting to see what other changes might be in store. At the start, I mentioned the four diners along Union Boulevard. All four diners served good, tasty breakfasts. Service at all was great, with the Golden Gate and the Top Diner leading the way for friendly, attentive service. Izzy’s and the Golden Gate carried the day for the strongest, old time diner charm and atmosphere. Izzy’s coffee was tops, strong and robust, with coffee at the Golden Gate a close second. My opinions only. Please comment with your thoughts. Wishing you all a happy and prosperous 2010! Christmas calls. Late this morning we headed north up Highway 33 to the Poconos on our annual trek for Christmas greenery. As we drove across the mountain at Wind Gap, we were awed by Saturday’s gift. Trees and bushes everywhere were covered in a luminous Christmas card white. Along Route 209 in Brodheadsville, about five miles west of Highway 33, we happened upon the Meadowbrook Diner. We decided to stop for breakfast. M. was intrigued by a sign on the restaurant’s west side and started to park there. I soon convinced him that it probably wasn’t intended for us. “Maybe when we retire dear,” I told him. With a deadpan expression, he replied “We’ll trade in your Jeep.” He winked then swung the vehicle into a more appropriate spot. 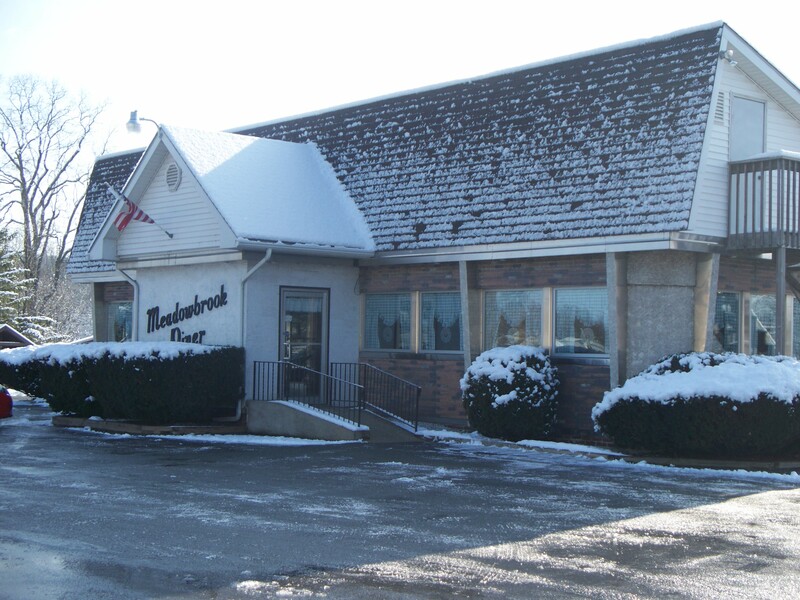 The Meadowbrook is not a large diner, but it has a cozy country feel. Inside, we were told we could sit where we wished. The small restaurant was packed but there were two booths available; we chose the one next to a window. As we waited for our waitress and M. settled himself with the morning news, I noted the smooth efficiency of the staff. Waitresses took orders and the bussers cleaned tables. When the waitress set our menus on the table, we asked for our usual coffees and water. We skimmed through the simple menu offerings – standard egg dishes, a variety of omelets, pancakes, and Belgian waffles. Our waitress set down our coffee mugs and water glasses, then took our order. I’d decided on a Belgian waffle. With an apologetic smile, she told me they’d run out of the Belgian waffles. Both M. and I settled on eggs and bacon. The coffee was well-prepared, not too strong, but with a fine, robust flavor. As we waited for our food, a co-worker of our waitress stopped by with a refill. We browsed the newspaper, and enjoyed the comfortable atmosphere. Soon our waitress arrived with two large plates of food. M. had ordered sunny-side up eggs and I’d ordered scrambled. The homefries were a bit buttery, but otherwise were thinly sliced, fresh tasting, and hot. Nicely browned, too. Our bacon was crisp, and the eggs were tasty and cooked to order. All in all, a comfortably good diner breakfast. Our total bill came to just under $17 (plus tip) for two orders that each included 2 large eggs, 4 slices of bacon, toast, a large serving of homefries, and 2 coffees with ample refills. Overall service was friendly and efficient, and the atmosphere was homey. 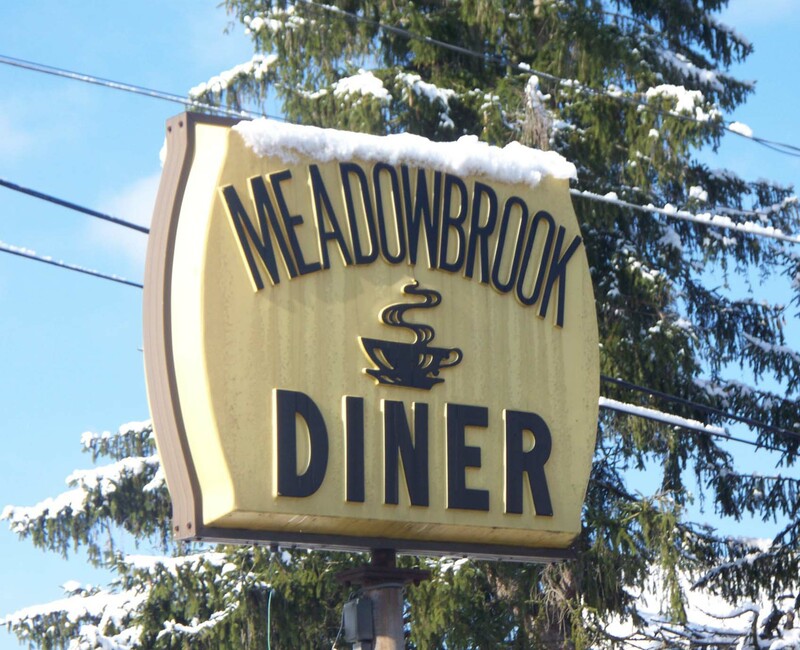 The Meadowbrook Diner III is located along the south side of Route 209 in Brodheadsville, roughly 5 miles west of Highway 33. Phone – 570-992-5205. We thought of going out for breakfast but the howling November wind sounds too cold and biting. It’s warm inside. From our kitchen the refrigerator calls, still half-filled with leftovers from our Thanksgiving feast. What better morning could there be to make a savory Turkey Hash for breakfast? In a large skillet, melt butter then sauté chopped onion until brown and tender. Stir in turkey, stuffing, and potatoes. Cook about 15 to 20 minutes, turning occasionally and pressing into pan until browned. Serve sprinkled lightly with fresh chopped parsley. Variations: Instead of mashed potatoes, use 2 cups cooked potatoes, white or sweet, cut into cubes. Add ½ to 1 cup turkey gravy with the turkey for added moisture. May also top with poached or sunny-side up eggs, if desired. Have an enjoyable post-Thanksgiving weekend! Amid the bustle of Thanksgiving Dinner preparations – slicing celery and chopping onions, peeling pounds of potatoes, roasting the turkey – Thanksgiving breakfast is often pushed aside. We grab a quick bowl of Raisin Bran, or steal a thin slice of pumpkin pie, and continue with the morning’s chores. 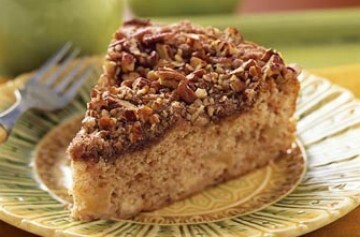 As a breakfast alternative, on Thanksgiving Eve I like to bake a tempting coffee cake to set on the counter. It makes a great breakfast offering to any potential pumpkin pie thieves (including me!). Best enjoyed with a mug of fragrant, hot coffee, or a tall glass of cold milk. Here’s a family favorite from the Krusteaz website. Preheat oven to 350° F. Place full pouch cake mix, 3/4 cup cinnamon topping, egg, sour cream and water in medium bowl. Stir until moistened. Fold in chopped apple. Spoon batter into lightly greased, 9-inch round pan. Sprinkle remaining cinnamon topping over batter. Top with pecans. Bake 45-50 minutes or until toothpick inserted into center comes out clean. Let cake cool 10-15 minutes before removing from pan. Makes 12 servings. In spite of the current faltering economy, the H1N1 virus, and other tragedies, we in America have much to be thankful for this Thanksgiving. We live in a free nation, with freedom to set our own goals, our own course. As we gobble down turkey and stuffing, and nibble at the pumpkin pie, let us ponder all that is good in our lives and give thanks! May you and your family enjoy a most blessed Thanksgiving! Halloween morning dawned slowly. Early drizzles were soon swept away by a warm drying breeze. Flame colored leaves blew from the trees. Promises of a fair day for folks young and old to march in Nazareth’s Halloween Day Parade. All in all, a good morning for breakfast at a restaurant named the Harvest Grill. As we entered, we spied a couple seated on a couch and chair near the front window. Deep in conversation, they seemed to enjoy their leisurely breakfast. We walked on into the elegant décor. Earth-toned granite tile floors and salmon-hued walls gave the whole restaurant a solid, classic look. We chose a corner table near the front. A pleasant young waitress delivered breakfast menus and took our drink orders. Coffee and iced water, as usual. As we waited, we scanned the menu. Many favorites to choose from but today it just took a minute or so to decide. When our fragrant coffee arrived in over-sized white mugs, we placed our orders. Eggs Benedict for M. while I chose Strawberry Stuffed French Toast. We sipped our coffee, as flavorful as the aroma. Chatting idly, we paged through the Morning Call and Express-Times, skimming articles ranging from the latest on the flu to the upcoming election. Tuesday, November 3rd – remember to vote! Our food arrived looking exquisitely delicious on the large white plates. Chef Bob certainly understands presentation! The waitress asked if I wanted syrup then brought a small pitcher. I didn’t need it. The thick French Toast was spread with cream cheese and strawberries, delightfully rich and sweet. M. enjoyed his Eggs Benedict, every bit as tasty as it looked. Although the food arrived hot, the one improvement, he said, would have been pre-warmed plates. Our total bill including tax came to just under $20 (plus tip) for Stuffed French Toast, Eggs Benedict including home fries and fruit, with a side order of bacon, and two cups of coffee with ample refills. Our food was of good quality, service was excellent, and the atmosphere inviting. It’s worth a visit! The Harvest Grill is located at 4062 Easton-Nazareth Highway, at the intersection of Highway 248 and Main Street in Nazareth, PA. 610-365-2964. There is adequate parking at the rear of the restaurant, and limited parking along the east side. They are open Tuesday through Sunday. Dinners allow for BYOB. The Harvest Grill also caters, and is available for private parties. NOTE: HARVEST GRILL is now under new ownership. Great restaurant but serves lunch and dinner only. The blacktop in front of the diner glistened from an early morning rain. Overhead, a light breeze puffed away the clouds, changing the sky from soft gray to powder blue. A few Saturday morning errands with my son included a stop at Jiffy Lube for an oil change. While the car was being serviced, the Palmer Diner seemed convenient for some hot coffee and a bite to eat. My son stops in occasionally but it had been a while since I’d been there. 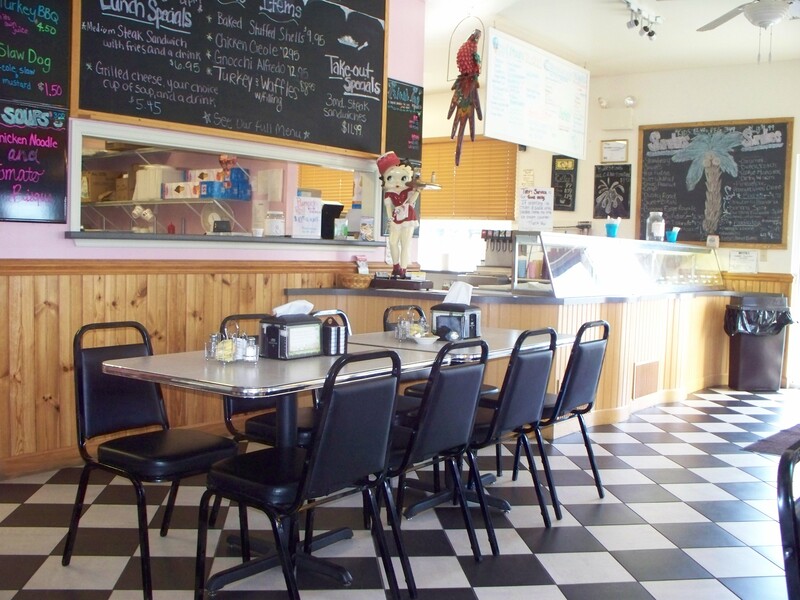 The restaurant looked refreshed since then – the floor tiled, the booths newer. We took a booth next to the window. The lone waitress, a sweet looking girl, brought over two menus. While she left to bring our coffees and water, we reviewed the offerings of standard breakfast fare. The coffee was delivered in a stainless steel carafe (by now, you may know how I love carafes!) then took our orders. Our food didn’t take long. Soon our friendly waitress was setting our rectangular plates in front of us. 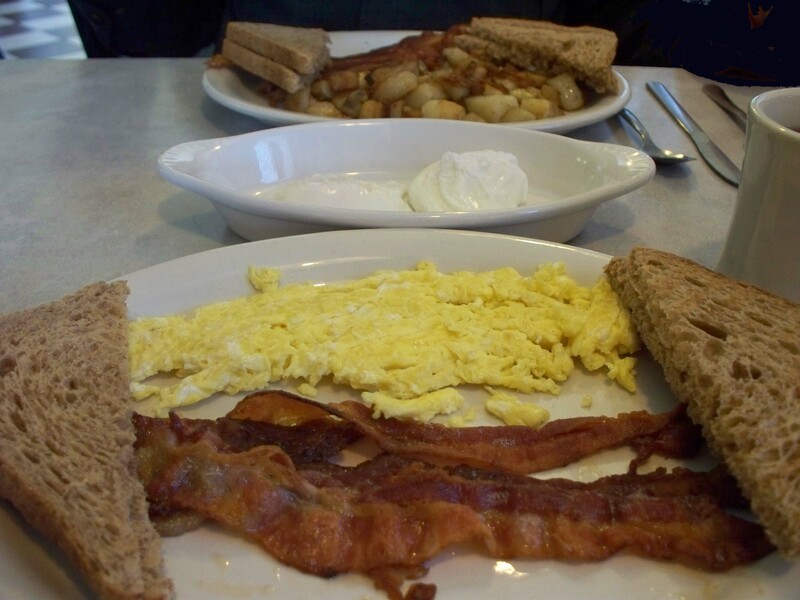 My son had ordered a standard for him – eggs, bacon, homefries, and wheat toast. I’d ordered one of my usual favorites – French Toast with a side order of bacon. The plates were new looking. More important, they were hot, assuring us of warm food. Our bacon was crispy and flavorful. His eggs were nicely scrambled. My French Toast was average, a little drier than I normally like, but still tasty. Nice presentation. Service was excellent with our waitress stopping back as needed to check on us. The interesting metal coffee carafe held ample refills of fresh-brewed coffee. Tables were cleaned promptly. Overall, our visit to Palmer Diner provided what we wanted – friendly service, decent food, and a clean and friendly atmosphere to visit. Our bill came to just under $12 (plus tip) for 2 eggs, homefries, bacon, and toast, and 2 slices of French Toast with a side order of bacon, plus two coffees. Reasonably priced in today’s economy. 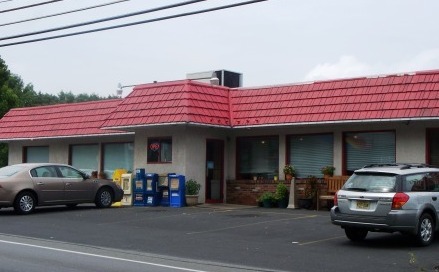 The Palmer Diner is located at 2913 Old Nazareth Road, Palmer Township, PA (across from Palmer Mall and just behind Jiffy Lube). 610-252-0164. They are open 6 am to 9 pm, 7 days a week. Their business card says they specialize in homemade food, and they provide a Senior Citizen Discount. Breakfast fundraisers are popular in the Lehigh Valley. They are a great way to help support the volunteers who risk all in case tragedy strikes. This Sunday morning, my husband and I drove north on Bushkill Center Road to visit one of the largest in the area–the Bushkill Township Volunteer Fire Co.’s monthly buffet breakfast. On such a beautiful day, it was no surprise to find a nearly filled parking lot. The breakfast is pay at the door – $7 for adults, $5 for seniors, and $4 for children. Age 6 and under are free. We were greeted with smiles. At the table there was a large jar for additional donations, and a raffle for a prized custom-made Martin Guitar (on display and beautiful!). Also on sale were assorted glassware with the fire company’s bright red logo. Once inside, we made our way toward the buffet line. On the way we passed a table with a huge box of assorted donuts, and two large bowls of canned fruit. Up front, there were two buffet lines with a condiment station at one end, all in a U-shaped formation. Condiments included syrup, two fruit toppings, cheese, and ketchup. These folks know what they’re doing. Breakfast foods included scrambled eggs, thin slices of scrapple, sausage links, mountains of bacon, regular toast, thick-sliced French Toast sprinkled with cinnamon, pancakes, waffles, potatoes, sauteed onions, creamed chipped beef, and probably some things I’ve forgotten. After we filled our plates (thick styrofoam with heavy duty plastic utensils), we found two vacant spots at one of the long tables then returned to the drink station for coffee, juice and water. Coffee cups were large. There was a restaurant-sized milk dispenser with both white and chocolate milk. Juices included orange, apple, and pineapple. Around us families of all ages, young and old, talked, laughed, and ate. The buffet was continually re-filled. Scrambled eggs were moist, still hot when I’d put them on my plate. I especially enjoyed the sausage links and pancakes, very tasty. M. mentioned how well organized the breakfast was. As plates were emptied, volunteers magically appeared to take them away. In the kitchens, cooks kept busy cooking to refill the buffet. We even saw a high chair brought over to one table. Occasionally during the meal, announcements were made about upcoming events – from Haunted Hayrides to a Craft Fair coming up in a few weeks. It was a lively, enjoyable morning, made possible by a well-organized team of workers. 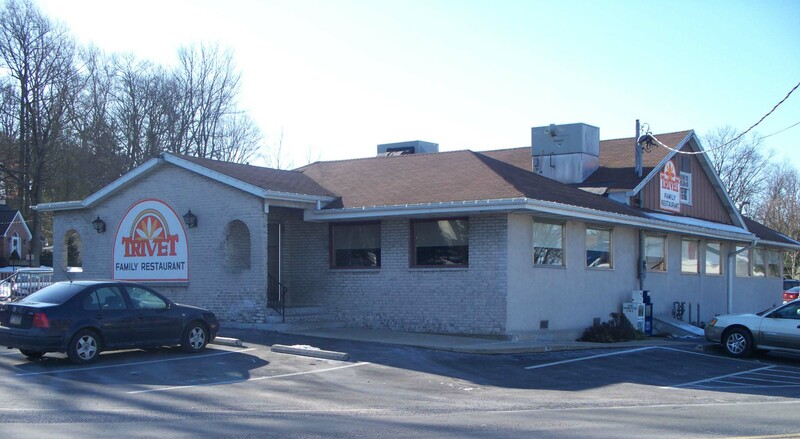 The breakfasts are held every 2nd Sunday at the Bushkill Township Volunteer Fire Co. Hall at 155 Firehouse Lane. That is just off of Bushkill Center Road, behind the Township Hall at 1114 Bushkill Center Road, Nazareth, PA. The next breakfast will be on Sunday, October 11, 2009 from 7:30 a.m. to 12:30 p.m. Try it! P.S. If you know of a breakfast fundraiser in the Lehigh Valley, send me the information. I’ll announce it on my sidebar. Comment here, or e-mail me at valleybreakfast@gmail.com. Bushkill Twnshp. Vol. Fire Co. Copyright © 2008-2013 by Breakfast in the Valley. All rights reserved.